The device will start arriving at Apple Stores, select carriers and authorized resellers later this week. 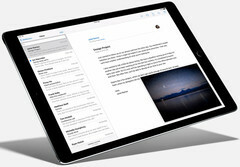 Apple’s monster tablet, the iPad Pro, was unveiled back in September. Today, the Cupertino giant officialy confirmed previous rumours that it will start taking orders for iPad Pro tomorrow, on November 11th. According to the company, the device will start arriving at Apple Stores, select carriers and authorized resellers as soon as later this week. The iPad Pro features a 12.9-inch Retina display with 2732 x 2048 pixels resolution and is powered by Apple’s own 64-bit A9X chip. According to the manufacturer, it provides is over 2.5 times more processing power than the A7 chip of the original iPad Air. The battery allow for up to 10 hours of running time. iPad Pro’s prices start at $799 for the 32 GB with Wi-Fi model and $1079 for the Wi-Fi + LTE 128 GB model. The tablet comes in three metallic color versions: silver, gold and “space gray”. Alongside the iPad Pro, Apple also launches two new accessories, the Apple Pencil for $99 and the Smart Keyboard for $169. The device will be available in Anguilla, Antigua and Barbuda, Australia, Austria, Belgium, Canada, Cayman Islands, China, Czech Republic, Denmark, El Salvador, Finland, France, Germany, Gibraltar, Greenland, Guatemala, Hong Kong, Hungary, Ireland, Isle of Man, Italy, Japan, Liechtenstein, Luxembourg, Malaysia, Mexico, Monaco, Netherlands, New Zealand, Norway, Poland, Portugal, Puerto Rico, Russia, Singapore, Slovenia, Spain, Sweden, Switzerland, Thailand, Trinidad and Tobago, Turkey, UAE, US, UK, Uruguay and US Virgin Islands.